Download the full Kaleido Insights report. 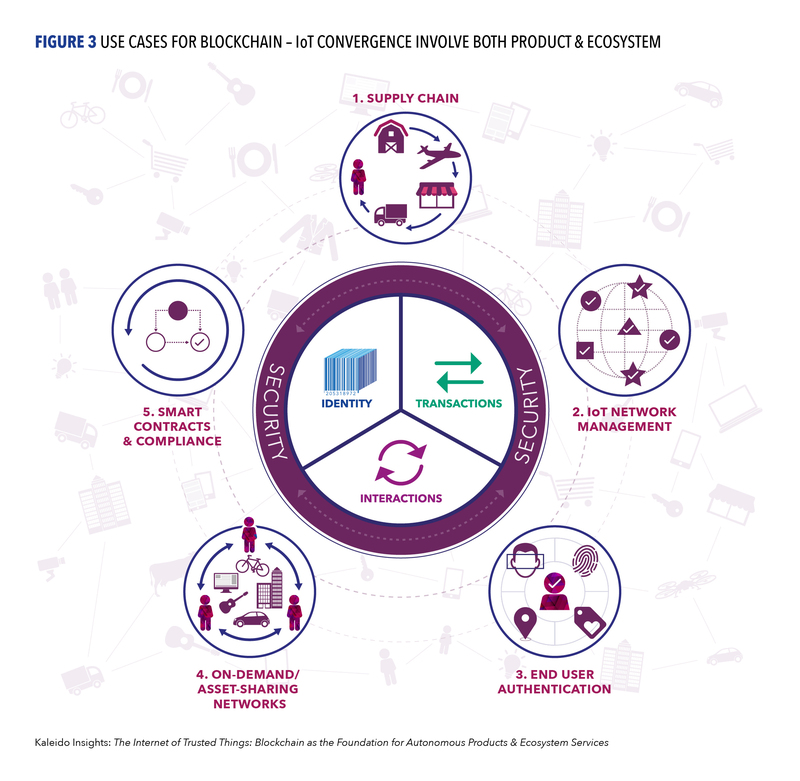 Our latest report is out, led by my colleague Jessica Groopman and building off prior blockchain research I’ve conducted. Beyond the cryptocurrency hype, how will Blockchain actually impact business models? When it’s combined with IoT technology, it will give a rise to autonomous systems working strongly. 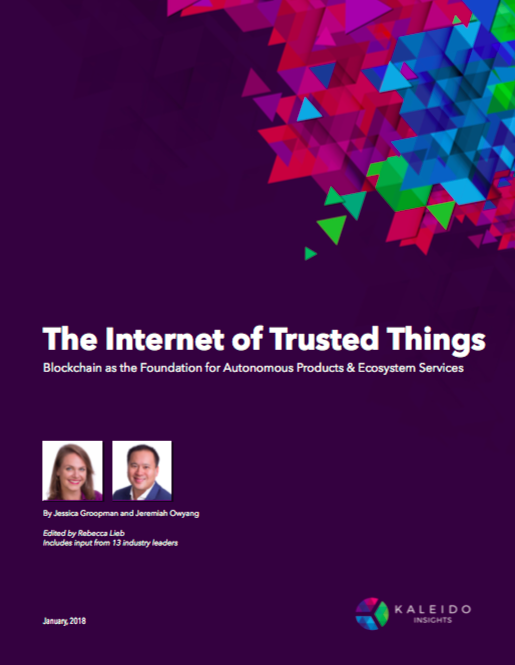 Here’s the report “The Internet of Trusted Things: Blockchain as the Foundation for Autonomous Products & Ecosystem Services” where we outline specific business use cases, and how it can impact supply chain, IoT network management, end user authentication, on-demand asset sharing networks, and finally, smart contracts. Blockchain technology has the potential to upend the way every industry manages its information and data, not only financial services. Imagine being able to track shipments through your supply chain with ease, down to the individual package or even component level. Or, executing a contract with a vendor without the need for an intermediary auditor. Blockchain can even help verify materials and food sourcing to ensure health and ethical standards are maintained. Though most who are familiar with the technology equate it to Bitcoin, opportunities abound in other verticals in effectively storing transaction, customer, and supplier data in a transparent, unchangeable ledger online. Any relationship that depends on third-party maintenance, or those that require multiple data sources to fulfill customer expectations for cohesive experiences, can be improved by blockchain applications. Legal: “Smart contracts” stored on the blockchain track contract parties, terms, transfer of ownership, and delivery of goods or services without the need for legal intervention. Supply Chain: By utilizing a distributed ledger, companies within a supply chain gain transparency into shipment tracking, deliveries, and progress among other suppliers where no inherent trust exists. Government: Blockchain offers promise as a technology to store personal identity information, criminal backgrounds, and “e-citizenship,” authorized by biometrics. Energy: Decentralized energy transfer and distribution are possible via micro-transactions of data sent to blockchain, validated, and re-dispersed to the grid while securing payment to the submitter. Food: Using blockchain to store food supply chain data offers enhanced traceability of product origin, batching, processing, expiration, storage temperatures, and shipping. Retail: Secure P2P marketplaces can track P2P retail transactions, with product information, shipment, and bills of lading input on the blockchain, and payments made via Bitcoin. Healthcare: Electronic medical records stored in a blockchain, accessed and updated via biometrics, allow for the democratization of patient data and alleviate the burden of transferring records among providers. Insurance: When autonomous vehicles and other smart devices communicate status updates with insurance providers via the blockchain, premium costs decrease as the need for auditing and authenticating data vanishes. Travel and Hospitality: Passengers store their authenticated “single travel ID” on the blockchain for use in lieu of travel documents, identification cards, loyalty program IDs, and payment data. Education: Educational institutions could utilize the blockchain to store credentialing data around assessments, degrees, and transcripts. As part of our research coverage on disruptive technologies, blockchain aligns with our prior research on the Collaborative Economy, where technologies strengthen P2P relationships to bypass central institutions. Additionally, blockchain technologies will be harnessed by autonomous technologies, enabling machine-to-machine transactions. Want to stay updated with our latest content, and research? Sign up for our newsletter. If you work for a large corporation, become a Crowd Companies member.